Yes the summer is almost over as we head into Labor Day Weekend. For September we have a a couple of themes for our audio book discounts which seem to be prolific women authors and getting focused on achievement. I confess that sometimes I can’t change the channel when those news mystery magazines highlight some strange case of murder. It seems to be human nature to want to know what motivates someone to unspeakable acts. We are always looking for a why in the story. Sometimes that answer is sadly there is no why only a sick individual. Ann Rule is a well-known true crime writer that tries to explain some of the strange crimes that take place more often than we would like to admit. 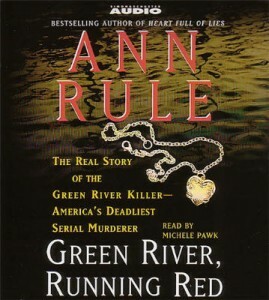 The Green River, Running Red audio book on special this month is a journey through the lives of not only the infamous serial murderer but also of his victims. The True Crime genre is one that we have not highlighted before but if you walk through any of those brick and mortar book stores you can see how popular these titles are. Ann Rule also defined the genre with her first book about Ted Bundy who she ended up working with at a Seattle suicide crisis center. It shouldn’t be surprising that these types of audio books are interesting to me since it is part of the Crime and Thrillers category that I love so much. I invite you to explore the True Crime audio books in our collection. The other prolific female authors on our discounts page are Sandra Brown, Anne Rice and Nora Roberts. All 3 have been able to turn out best selling audio books consistently over the years. The other titles on special this month revolve around Goal Setting and maintaining a Positive Attitude. Though selp help books on these topics can be popular at the beginning of the year they also are popular when you begin major undertakings in life. September is a month that coincides with the beginning of a new school year or a fresh start after a summer of recuperation. Let’s welcome the Fall Season with a new attitude!